Shantale Person was born in Fayetteville, NC on May 28, 1987. As a young child her family eventually settled in Chesterfield, VA and as the years went by her family and peers did not know that she would grow up to be the lyricist she is today. Being brought up by a very poetic mother she learned to express her emotions through poetry and song. As Shantale began looking for a name to define herself the name Ms Proper came to her during a car ride one afternoon. Ms Proper felt the name fit her not only lyrically but personally. 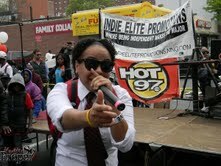 She is at the forefront of the city’s renaissance of talented Hip Hop artists. Since her first release “Addicted To The Game” in 2007, she refined her craft and gained notice from both industry and fans; yet it was her 2nd mixtape release “The Wake Up”; her sophomore project released in 2009, which put Ms Proper on the map. In 2010, Ms Proper released her 3rd mixtape, “Proper Etiquette”, which received even more attention from fans and industry insiders. Her music has been featured on three different Digital Dynasty mixtapes within the year and she was recently nominated for the Indie Elite Achievement Award. She has opened for Jae Millz, Big K.R.I.T, Cyhi Da Prince, Rah The MC, Force MD’s, Olivia, Mims, and Pretty Ricky. After two auditions on March 12, 2011 Ms Proper was chosen by executive producer and writer of B.E.T’s 106 & Park, Pat Charles, to perform on the show which would later air on July 13, 2011. Ms Proper’s 4thmixtape” #NoDaysOff” featuring DJ White Owl was released July 2, 2011 and is destined to show people more of what this artist and CEO of her own label, So Proper Entertainment, has in store. Continuing her music career and embarking on a new journey as co-host of the online radio show Rated R Radio, Ms Proper is always on the microphone and always ready for her next challenge. 3375 How did you come up with the name Ms. Proper? MSPROPER Honestly it just came to me one day. I feel Ms Proper represents not only the image I tend to convey to my artist but the person I am. People always say I speak "proper". 3375 When did you first fall in love with hiphop and what made you decide to give it a go? MSPROPER I would have to say I fell in love with Hip Hop as a child when my mother taught me "La Di Da Di"by Slick Rick and Doug E Fresh. I knew in middle school I wanted to be in the industry but I didnt actually pursue a career as an artist until about 2005. 3375 Being a female rapper do you feel like you have to prove yourself twice as hard . What drives you? MSPROPER I honestly think other people focus on the fact that I am a female rapper more than I do. I just want to be respected as an overall talented artist. I'm driven by life. Just like other people I have a story and I want to share it with the world to inspire others. 3375 Is there a main topic you talk about in your songs or do you discuss everything? MSPROPER Nothing is exempt from my lyrics. If I want to talk about it I do. Music is the one place I can truly be free and say what I want without judgment. 3375 What does being creative mean to you? MSPROPER Being an individual and staying true to what is you. 3375 What differentiates you from other artist? MSPROPER A lot of people claim they want the success of being a musician but they don't really want to put in the work. My team and I truly grind it's not just a morning tweet. performance to date. I'm proud of myself and my team for what we accomplished that day. 3375 Is there anything your fans will be surprised to know about you. MSPROPER I'm a nerd haha. When I say "Hip Hop made me cool" it really is a true statement. However, my thirst for knowledge works in my favor. 3375 Tell us about Rated R Radio? MSPROPER Rated R Radio is an online radio show hosted by myself and my co-host Mr Yeah with our DJ YaBoi Tiz. Currently we host an open mic every Wednesday from 8-11pm at Shotz (1719 E Main St Richmond, VA). Soon we will be getting back into the sitdown interviews as well. There is a lot blooming with this endeavor and I'm excited for our viewers and my fans to be apart of it. 3375 What can you fans expect from you in the future? MSPROPER I will be shooting some videos with Jay Aura from both #NoDaysOff, which was released last year, and my upcoming project Escaping Reality. Basically we are cranking everything up a notch from the shows to the merchandise. 3375 Where can we find updates on Ms.Proper? MSPROPER Your best bet is to follow me on twitter at @MsProper. You can also follow @TeamMsProper for the latest updates on shows, music, etc.